The Horror Section: Doomsday Is Here! 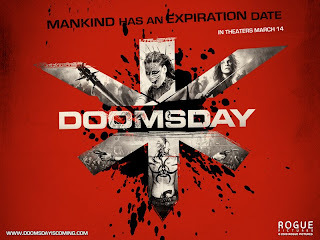 I wasn’t going to do a review for Neil Marshall’s new movie Doomsday because it turned out to be an actioner and not horror, but since I did put it on my top anticipated of ’08, I figured I should say a few words about it. Set in the future, a deadly virus has caused Scotland to be walled off and the inhabitants left for dead. Many years later, the contagion appears outside the walls and satellite images reveal life inside the quarantine area. An elite extraction team headed by Major Sinclair (Rhona Mitra) is sent to find a cure before the entire UK is consumed. Doomsday is all a matter of acceptance. If you go in expecting The Descent, I would imagine you are going to be sorely disappointed. However, go in like you are entering a time machine that goes back to the eighties and you should have a lot of fun. This is a very bold choice on Marshall’s part because everyone (myself included) was expecting him to do another horror film. Instead, he decided to do something that basically reads like a love letter to the films that obviously inspired him. The influence of Escape From New York and The Road Warrior is immediately apparent, as is a smattering of Aliens. I enjoyed watching this movie, but only after I realized what it was and what it wasn’t. Rhona Mitra (whom I’ve always liked way back to her humble beginnings as a Lara Croft model), while no Milla, is certainly no slouch. It looks like she really buffed up for the role. Doomsday has a parade of recognizable faces. In addition to Malcolm MacDowell (who is sadly underutilized) and Bob Hoskins, there is Alex Siddig, Martin Compston and David O’Hara. Also appearing, making it sort of a Marshall reunion, is Sean Pertwee (Dog Soldiers) and Nora-Jane Noone & MyAnna Buring (The Descent). Doomsday is a fun action movie. It reminded me of Rambo 4 a little, in that if you are willing to go along for the ride, you'll enjoy it. While not as fresh or edgy as his previous two efforts, there is no doubt that Marshall makes entertaining films, no matter what the genre. More Jessica Lucas? Yes please! Two stories. One Lost Girl.